(mark and I) bed. This is after I got up. She's so sweet! Kim,Chloe is precious. She is enjoying her nap. I like her pretty attire. She will be good at playing the piano with her nice long fingers or basketball. Hope you got your work done for today. 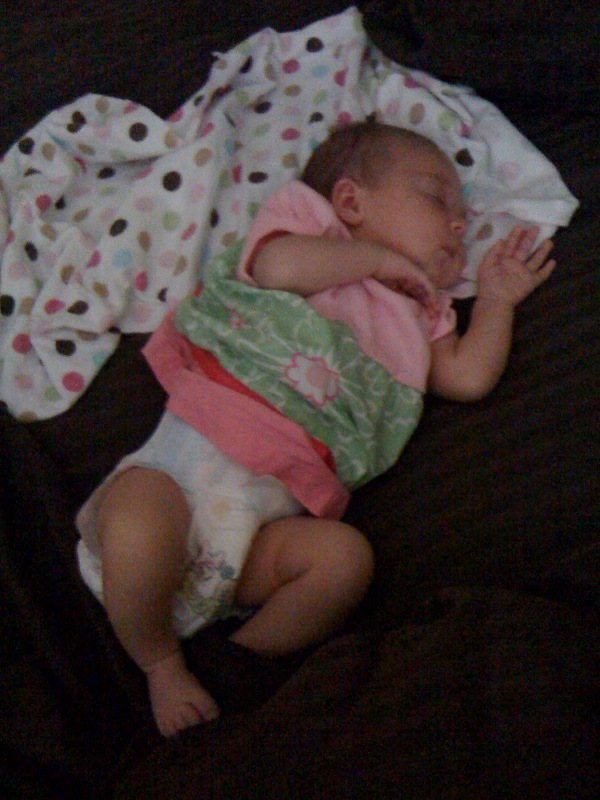 There is just nothing cuter than a sleeping baby! Enjoy all that cuddle time!! They get big fast and don't want to cuddle with you anymore! Although I know it's hard to focus on cuddling when you have a mile long to do list in your head! Bless her heart, she's worn out! Enjoy when she wants to cuddle now, it won't last long! Love ya! Enjoy the cuddle time. Like Sarah and Tori both said it won't last. When Chloe get more mobile she won't want to be slowed down by cuddling. Nap time together is gooood!